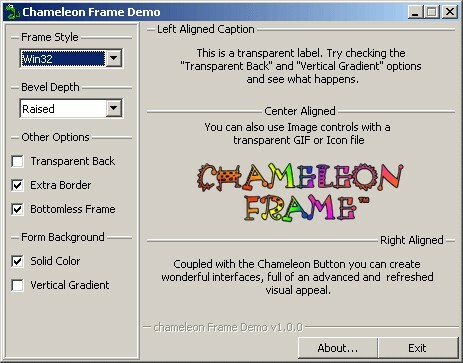 Chameleon Frame 1.0.1 is active x software developed by gonchuki. The Chameleon Frame is able to reproduce the styles that everyone knows from various environments, plus it adds some useful others. They are all reproduced in a very accurate way, and best of all, they are drawn VERY FAST!!! The Chameleon Frame includes 7 different styles, and has many advanced features that makes it an ideal control to enhance the user interface. Chameleon Frame 1.0.1 supports different languages (including English). It works with Windows 98/XP/Vista. Latest Chameleon Frame 1.0.1 does not contain any spyware and/or advertise modules, allowing installing it with no worries concerning valuable information loss. We has completely tested active x software Chameleon Frame 1.0.1 many times, written and published the interesting article and uploaded installation file (103K) to our fast server. Downloading Chameleon Frame 1.0.1 will take several seconds if you use fast ADSL connection. Chameleon Show is an Adobe GoLive Action for creating slideshows with many unique features.